Pretty famous amongst skateboarders, the Fitzroy bowl is a super fun old school bowl. Rip around it generating as much speed as you can then frontside grind the coping at the deep end which is all beat up from years of abuse. Extremely satisfying. More than worth checking out. Many features. Little old now. Huge metal vert ramp. Stairs, rails, banks. Mini bowl. A copy of the famous Fitzroy bowl over east. Small street section off to the side also with banks and ledges. Lumpy and fun once you find your lines. Pyramid is mellow but gives good pop when you hit it right. 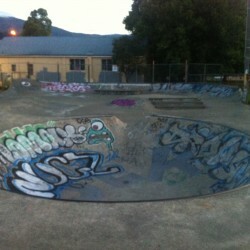 The skatepark is nice and close to downtown Nelson. 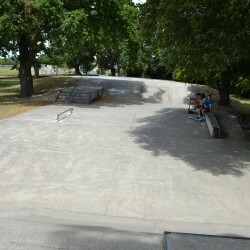 Small park with a bowl, ramps with varied edges, small staircase a couple of rails and a basic funbox. Local kids said they would like a spine and a shallow inset roll-in bowl. Appears to be a re-purposed outdoor skate rink, with surrounding velodrome. Lots of open space and variety of levels of challenge, but could stand to have a few more features. The Saugeen Shores skatepark is one of those places that just works. 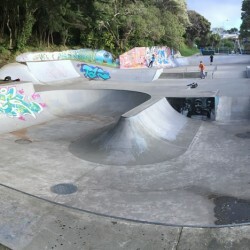 All the features you would expect from a decent skatepark, rails, ledges, good transition, along with stairs and a fairly gnarly vert extention out of the bowl area. 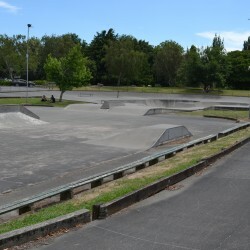 Huge skatepark, get there and go and skate it. Mulitple bowls, snake run, massive sprawling street course. Something for everyone and more. 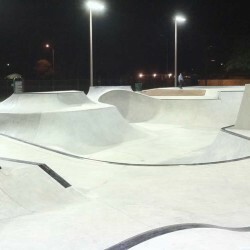 Epic skatepark consisting of 2 bowls and a street course. The main bowl is something out of the x-games, mulitple lines, hips and transfers. The second bowl is a pool style amoeba bowl. Something for everyone here, especially if your a transition skater. 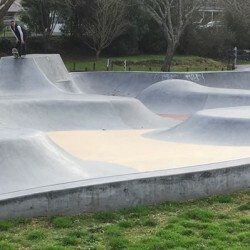 Skatepark built by Grindline Skateparks.